In which G.M. Norton shines the sartorial spotlight on another eccentric dandy. What time is it, chumrades? Dandy o’clock, of course! I am tickled pink to introduce you to the splendidly-named Sir Royston Buckingham-Hurst. Thankfully, as well as boasting a rather natty name, Sir Royston is also a rather natty dresser and worthy of being the latest incumbent to Norton of Morton’s ‘Real-life dandy’ feature. I first came across Sir Royston on Facebook (by the way, chums – Norton of Morton now has a Facebook page so do give it a ‘Like’). Bowled over by his impeccable style, I wasn’t surprised to discover that Sir Royston is the proud proprietor of the online gentleman’s emporium, Fogey Unlimited. With an unlimited stash of clobber within his reach, I really do admire his ability not to keep it all to himself. Bravo, Sir! Please enjoy this little interview with the great man himself. 1. What does a dandy mean to you? Confirmed traditionalist, Fogey and complete and utter tweedophile. 3. If you could choose one era in time, what would it be and why? 1910 to 1930. The look, style, music and general vibe. 4. What's your favourite item of clothing and why? 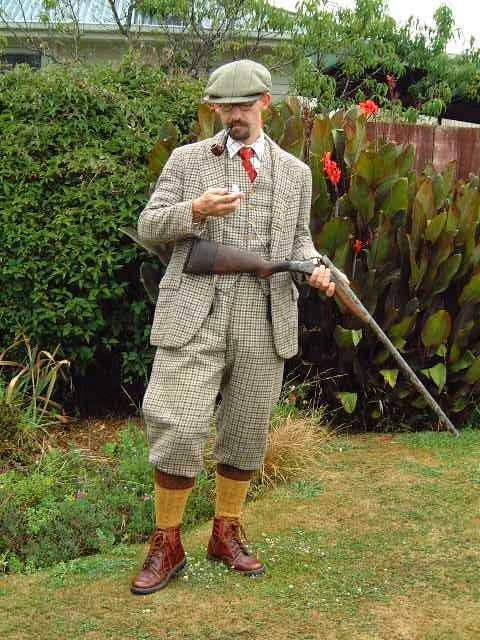 A tweed shooting suit. Anything tweed, plus fours and Thurston boxcloth braces! 5. How long have you been dressing like you do? Since the age of about 10 where I wore a tweed jacket to a wedding. It all started from there. 6. Do you ever dress down? 7. How do you put together an outfit? Do you spend a long time planning it or do you just pull it together? I do think about it, however having so many combinations of suits and tweed, not to mention every colour of cords and moleskin trousers available, it’s usually not a problem. 8. Where do you get your clothes from? Fogey Unlimited, of course! Although Huntsman, Cordings, Pakeman and a variety of tailors do get a look in. 9. You must attract a lot of attention from people because of the way you present yourself. What kind of things do people say to you? Usually very kind words. The handlebar moustache gets comments. 10. What people or things inspire you? Anybody who doesn’t follow the latest fashion. Style, NOT FASHION. 11. There are lots of sartorial rules, it seems. 'Never brown in town' and 'don't wear a matching tie and pocket square'. Do you follow any rules? I would never, ever wear brown shoes with a dark suit. Never a hat indoors. It’s perfectly acceptable to wear a tweed suit in town nowadays, as at least its showing some style. 12. You own a gentleman's vintage clothing emporium, Fogey Unlimited. What inspired you to start this business? I used to live in New Zealand and couldn’t find the items of clothing I wanted, so had to import them myself. Which made me realise there must be others such as myself. 13. What is your definition of a gentleman? Manners maketh the man. Anybody who seems effortless in their attire. Just that ‘knowing’ how to dress. 14. Are there any particular accessories you like to wear? I’m very keen on accessories. I always wear braces, armbands and sock suspenders. Couldn’t do without them. 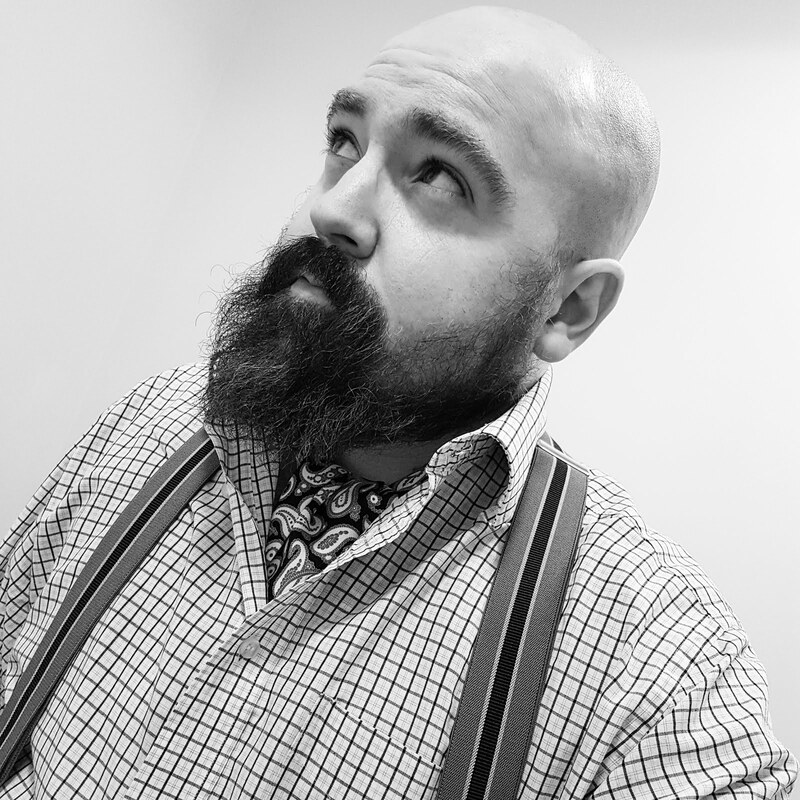 Rather partial to stiff collars too and for the dress down moments, I love a cravat and Tattersall waistcoat. Did you enjoy that? What a perfect example of an English gentleman. Norton of Morton readers can take advantage of a generous 20% off at Fogey Unlimited by using the code NORTON20 at the checkout. Before I toddle off for another week, please note that voting closes at midnight tonight for the National Vintage Awards. Do give this periodical a vote for 'Best Vintage Fashion/Lifestyle Blog'.